It is natural, I suppose, to surround oneself with people whose political, religious, and philosophical beliefs we share. We tend to get along best with people whose values are aligned with our own, and having the same opinions makes conflict less likely. So what I'm going to suggest runs completely counter to this tribal tendency that all humans have. Anyone who aspires to a skeptical view of the world should seek out interactions with people of opposing stances. I won't say this isn't frustrating at times. Hearing our most cherished viewpoints criticized, sometimes stridently, brings up some pretty strong emotions. But there are two outstanding reasons to strive for diversity in our social circles, and I think that both of these make a cogent argument for overcoming our knee-jerk reactions to having our baseline assumptions called into question. First, being exposed to a wide range of opinions keeps us honest. It is an all-too-human failing not to question things when everyone around us is in agreement. This can lead not only to our making mistakes, but not realizing them -- sometimes for a long time -- because we've surrounded ourselves with a Greek chorus of supporters, and no one who is willing to say, "Wait a minute... are you sure that's right?" Second, it becomes less easy to demonize those who disagree with us when they have faces. You can slide quickly into "those awful conservatives" or "those evil atheists" -- until you meet one, and spend some time chatting, and find out that the people you've derided turn out to be friendly and smart and... human. Just like you. 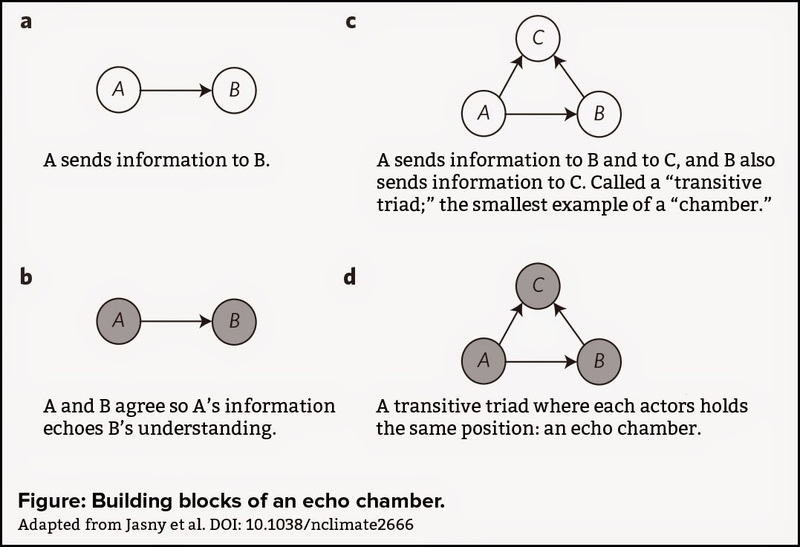 The danger of living in an echo chamber was illustrated vividly by a new peer-reviewed study led by Dana Fisher, professor of sociology at the University of Maryland. Fisher et al. looked at how attitudes about climate change in particular are affected by being surrounded by others who agree with you. They found that networks of people who are already in agreement, sharing information that supports what they already believed, create a context of certainty so powerful that even overwhelming scientific evidence can't overcome it. "Our research shows how the echo chamber can block progress toward a political resolution on climate change," Fisher said in an interview. "Individuals who get their information from the same sources with the same perspective may be under the impression that theirs is the dominant perspective, regardless of what the science says... Information has become a partisan choice, and those choices bias toward sources that reinforce beliefs rather than challenge them, regardless of the source’s legitimacy." Lorien Jasny, a lead author of the paper, emphasized how important it was to venture outside of the echo chamber. "Our research underscores how important it is for people on both sides of the climate debate to be careful about where they get their information. If their sources are limited to those that repeat and amplify a single perspective, they can’t be certain about the reliability or objectivity of their information." While the study by Fisher et al. was specifically about attitudes regarding climate change, I would argue that their conclusions could be applied in a much wider context. We need to hear opposing viewpoints about everything, because otherwise we fall prey to the worst part of tribalism -- the attitude that only the members of the tribe are worth listening to. It's why liberals should occasionally tune in to Fox News and conservatives to MSNBC. It's why the religious shouldn't unfriend their atheist Facebook friends -- and vice versa. It's why my friend and coworker who tends to vote for the opposite political party than I do is someone whose views I make myself listen to and consider carefully. Now, don't mistake me. This doesn't mean you should put up with assholes. The social conventions still apply, and disagreeing philosophically doesn't mean you call the people on the other side idiots. I have chosen to disconnect from people who were rude and disagreeable -- but I hope I'd do that even if they shared my political views. Put simply, we need to be pushed sometimes to overcome our natural bent toward surrounding ourselves with the like-minded. When we do, we become less likely to fall prey to our own biases, and less likely to pass unfair judgment on those who disagree with us. The work by Fisher et al. 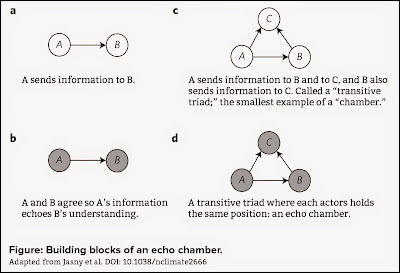 shows us how powerful the echo chamber effect can be -- and why it's critical that we get ourselves out of it on occasion, however comforting the illusion of certainty can be at times.